Although it’s a bit outdated (having been created in 2007 and not updated since, the New York Times published a very interesting interactive online tool called “Paths to the Top of the Home Run Charts” that allows fans to view a year-by-year comparison of how several members of the 500 Home Run Club® stacked up against each other at various ages. 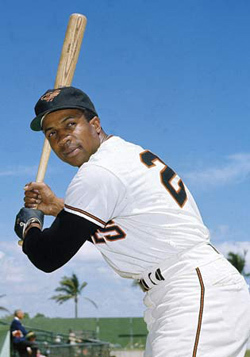 For example, both Frank Robinson and Hank Aaron hit their 300th career dinger around their 30th birthday, but “Hammerin’ Hank continued his upward trajectory to 755 at age 42, while Fierce Frank’s production leveled out before he hit his final homer #586 in his mid 30s. The interactive stat chart shows that, while Mel Ott was the youngest player to reach 100 home runs (22 years, 132 days), Eddie Mathews was the fastest to 200 long balls and Alex Rodriguez is by far the youngest Major Leaguer to hit 300-400-500 round-trippers. Ken Griffey, Jr. once considered to be the best threat to break Bonds’ career home run record, blasted his way up the chart from age 26 to 31, but was hampered by injuries and never regained his early career home run pace. By clicking on Ted William’s bar you can see just how much of an impact his years of military service had on his home run output. Each time “The Splendid Splinter” would skyrocket up the chart, he left on another tour with the Navy and his career would have to be put on hold. Ever the patriot, Ted never regretted the impact is military service had on his baseball career…. saying serving Uncle Sam was much more important than pursuing hitting titles. He finished with the highest career batting average of any player with 500 or more homers (.344) and an average of one home run every 14.8 times he stepped to the plate from 1939-1960.